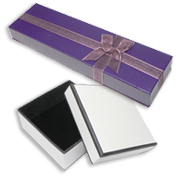 Shop the best closeout jewelry gift boxes, for your precious collection of bracelets, earrings, pendants, rings, necklaces & more. Find elegant pieces, in many styles & colors: gold, red, blue & silver items, made of leatherette, satin or cardboard. Perfect for packaging & retail jewelry sales. Get the best deals thanks to our wholesale discounts!